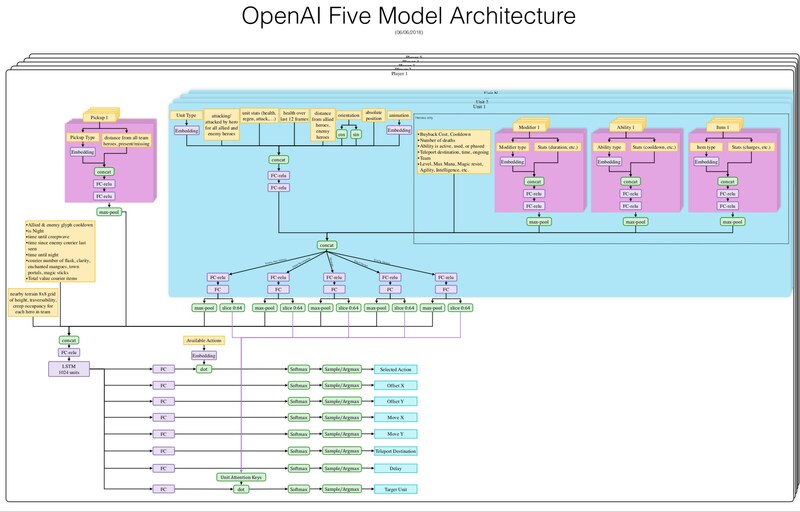 This blog post is my study notes on OpenAI Five. I am not involved in the research effort. objective -> destroy enemy’s throne. to do that you have to destroy the 4 layers of defensive towers while the other team is defending them/attacking your tower. There are 115+ (and growing) unique heroes with unique spells and play styles. Each hero has access to 3 spells and one (usually long cooldown) ultimate spell. Established game with millions of player worldwide. 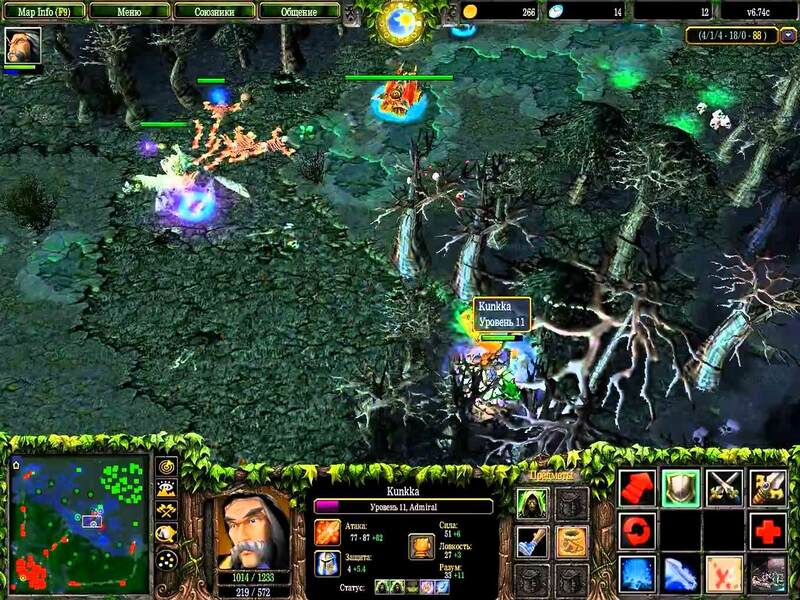 It was released the year 2003 as a map of Blizzard’s Warcraft 3 game. Super popular e-sports with largest-prize pool tournament in the world. there is an average of ~1,000 valid actions each tick. The average number of actions in chess is 35; in Go, 250. Valve’s Bot API shows as many as 20,000 (mostly floating-point) numbers representing all information a human is allowed to access. A chess board is naturally represented as about 70 enumeration values; a Go board as about 400 enumeration values. I started playing this game more than 13 years ago when I was still in high school/college. The game has been actively developed for over a decade. The game also gets an update about once every two weeks, constantly changing the environment semantics. simpler version that only works for 1v1. With a single hero (Shadow Fiend). 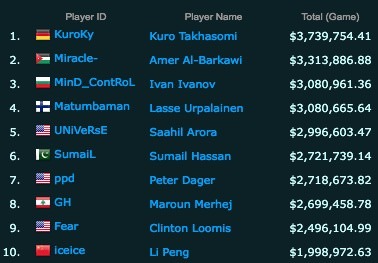 result: beat all contestants, who themselves are top Dota players in the world. 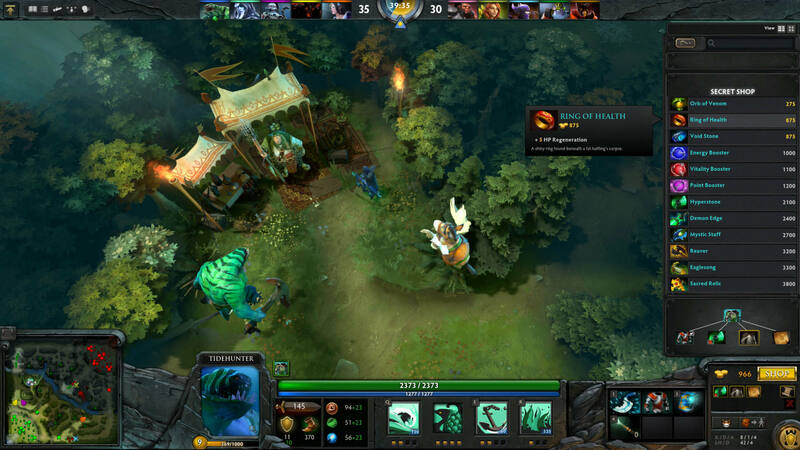 It’s a team of five neural networks that can work together to fight five human players in the game of Dota. The 256 P100 optimizers are less than $400/hr. You can rent 128000 preemptible vcpus for another $1280/hr. Toss in some more support GPUs, and we’re at maybe $2500/hr all in. they have trained, 2+ months, so around $4 million so far just for hardware. Each of OpenAI Five’s networks contain a single-layer, 1024-unit LSTM that sees the current game state (extracted from Valve’s Bot API ) and emits actions through several possible action heads. Each head has semantic meaning, for example, the number of ticks to delay this action, which action to select, the X or Y coordinate of this action in a grid around the unit, etc. Action heads are computed independently. Even with OpenAI restrictions, there are hundreds of items, dozens of buildings, spells, and unit types, and a long tail of game mechanics to learn about — many of which yield powerful combinations. It’s not easy to explore this combinatorially-vast space efficiently. OpenAI Five learns from self-play (starting from random weights), which provides a natural curriculum for exploring the environment. To avoid “strategy collapse”, the agent trains 80% of its games against itself and the other 20% against its past selves. In the first games, the heroes walk aimlessly around the map. After several hours of training, concepts such as laning , farming , or fighting over mid emerge. 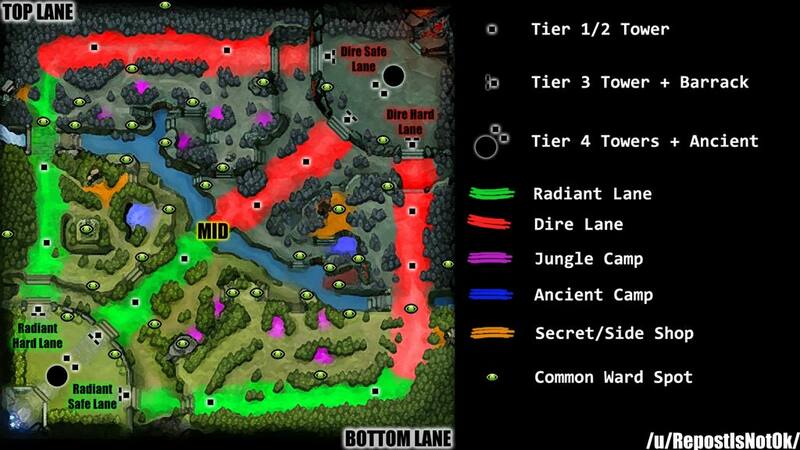 After several days, they consistently adopt basic human strategies: attempt to steal Bounty runes from their opponents, walk to their tier one towers to farm, and rotate heroes around the map to gain lane advantage. And with further training, they become proficient at high-level strategies like 5-hero push . OpenAI Five does not contain an explicit communication channel between the heroes’ neural networks. Teamwork is controlled by a hyperparameter OpenAI dubbed “team spirit”. Team spirit ranges from 0 to 1, putting a weight on how much each of OpenAI Five’s heroes should care about its individual reward function versus the average of the team’s reward functions. OpenAI anneals its value from 0 to 1 overtraining. Gym is a toolkit for developing and comparing reinforcement learning algorithms. It supports teaching agents everything from walking to playing games like Pong or Pinball . Competitive Self-Play allows simulated AIs to discover physical skills like tackling, ducking, faking, kicking, catching, and diving for the ball, without explicitly designing an environment with these skills in mind. Self-play ensures that the environment is always the right difficulty for an AI to improve. 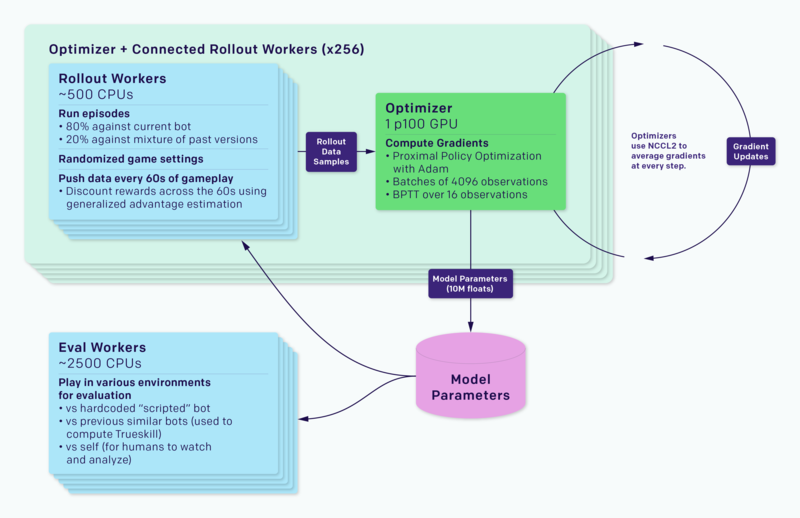 The training system is separated into rollout workers, which run a copy of the game and an agent gathering experience, and optimizer nodes, which perform synchronous gradient descent across a fleet of GPUs. The rollout workers sync their experience through Redis to the optimizers. Each experiment also contains workers evaluating the trained agent versus reference agents, as well as monitoring software such as TensorBoard , Sentry , and Grafana . During synchronous gradient descent, each GPU computes a gradient on its part of the batch, and then the gradients are globally averaged. OpenAI originally used MPI’s allreduce for averaging, but now use OpenAI own NCCL2 wrappers that parallelize GPU computations and network data transfer. NCCL2 = The NVIDIA Collective Communications Library (NCCL) implements multi-GPU and multi-node collective communication primitives that are performance optimized for NVIDIA GPUs. NCCL provides routines such as all-gather, all-reduce, broadcast, reduce, reduce-scatter, that are optimized to achieve high bandwidth over PCIe and NVLink high-speed interconnect. 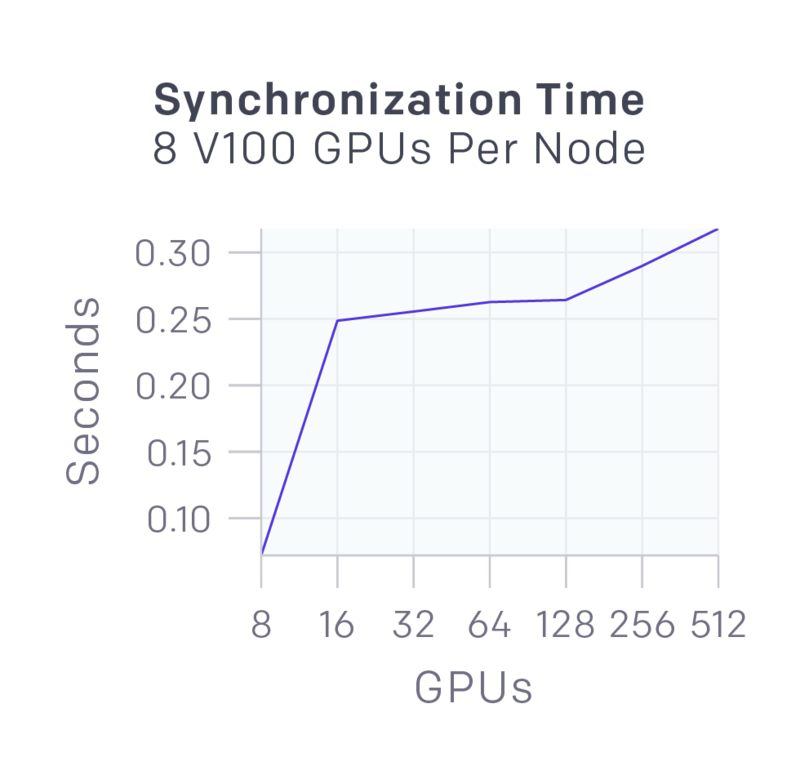 The latencies for synchronizing 58MB of data (size of OpenAI Five’s parameters) across different numbers of GPUs are shown on the right. The latency is low enough to be largely masked by GPU computation which runs in parallel with it. OpenAI implemented Kubernetes, Azure, and GCP backends for Rapid. Each hero’s reward is a linear combination of separate signals from the game. Each of these signals produces a score, and the agent’s reward is the increase in score from one tick to the next. These signals and weights were designed by OpenAI local Dota experts at the start, and have only been tweaked a handful of times since. agent receives a special reward to encourage exploration called “lane assignments.” During training, OpenAI assigns each hero a subset of the three lanes in the game. The model observes this assignment, and receives a negative reward (-0.02) if it leaves the designated lanes early in the game. Team Spirit OpenAI wants them to take into account their teammates’ situations, rather than greedily optimizing for their own reward. For this reason, OpenAI average the reward across the team’s heroes using a hyperparameter τ called “team spirit”: hero_rewards[i] = τ * mean(hero_rewards) + (1 - τ) * hero_rewards[i] OpenAI anneals τ from 0.2 at the start of training to 0.97 at the end of OpenAI current experiment. teams: 1. Best OpenAI employee team: 2.5k MMR (46th percentile) 2. Best audience players watching OpenAI employee match (including Blitz, who commentated the first OpenAI employee match): 4-6k MMR (90th-99th percentile), though they’d never played as a team. 3. Valve employee team: 2.5-4k MMR (46th-90th percentile). 4. Amateur team: 4.2k MMR (93rd percentile), trains as a team. 5. Semi-pro team: 5.5k MMR (99th percentile), trains as a team. Versions: * The April 23rd version of OpenAI Five was the first to beat OpenAI scripted baseline. * The May 15th version of OpenAI Five was evenly matched versus team 1, winning one game and losing another. * The June 6th version of OpenAI Five decisively won all its games versus teams 1-3. OpenAI set up informal scrims with teams 4 & 5, expecting to lose soundly, but OpenAI Five won two of its first three games versus both. Observations: * Repeatedly sacrificed its own safe lane (top lane for dire; bottom lane for radiant) in exchange for controlling the enemy’s safe lane, forcing the fight onto the side that is harder for their opponent to defend. This strategy emerged in the professional scene in the last few years, and is now considered to be the prevailing tactic. * Pushed the transitions from early- to mid-game faster than its opponents. It did this by: (1) setting up successful ganks (when players move around the map to ambush an enemy hero — see animation) when players overextended in their lane, and (2) by grouping up to take towers before the opponents could organize a counterplay. * Deviated from current playstyle in a few areas, such as giving support heroes (which usually do not take priority for resources) lots of early experience and gold. OpenAI Five’s prioritization allows for its damage to peak sooner and push its advantage harder, winning team fights and capitalizing on mistakes to ensure a fast win. the bot instantly sees data like positions, healths, and item inventories that humans have to check manually. because just rendering pixels from the game would require thousands of GPUs. this is cost saving method. OpenAI Five averages around 150-170 actions per minute (and has a theoretical maximum of 450 due to observing every 4th frame). Frame-perfect timing, while possible for skilled players, is trivial for OpenAI Five. OpenAI Five has an average reaction time of 80ms, which is faster than humans. different heroes have a different need for higher APM. the 5 heroes that OpenAI chose are considered ‘beginner’ heroes in that they require fairly low APM to play. all the 5 heroes also are ranged heroes who are considered easier to play. Binary rewards can give good performance. OpenAI 1v1 model had a shaped reward, including rewards for last hits, kills, and the like. 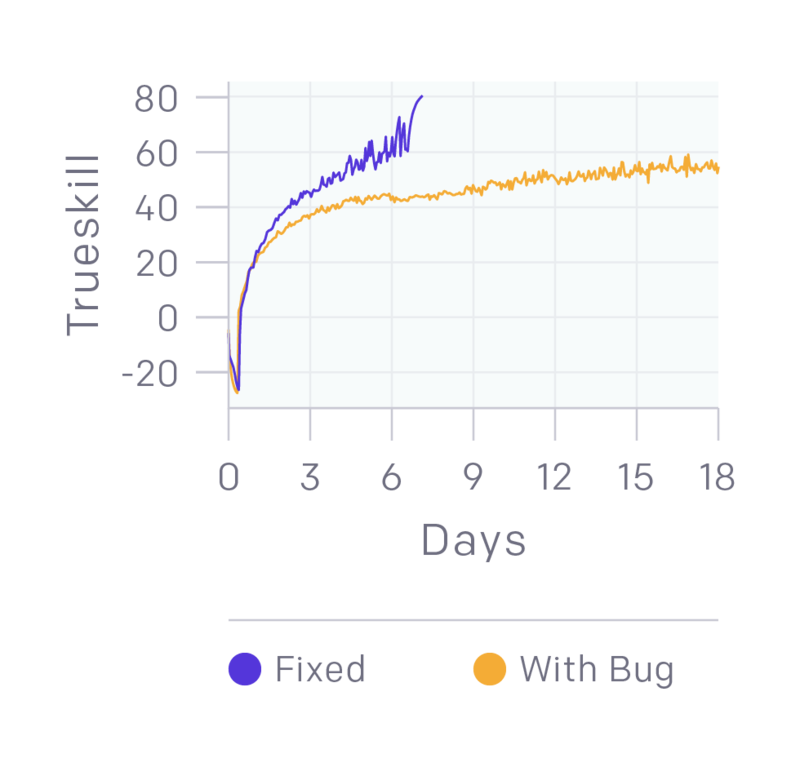 OpenAI ran an experiment where OpenAI only rewarded the agent for winning or losing, and it trained an order of magnitude slower and somewhat plateaued in the middle, in contrast to the smooth learning curves OpenAI usually see. 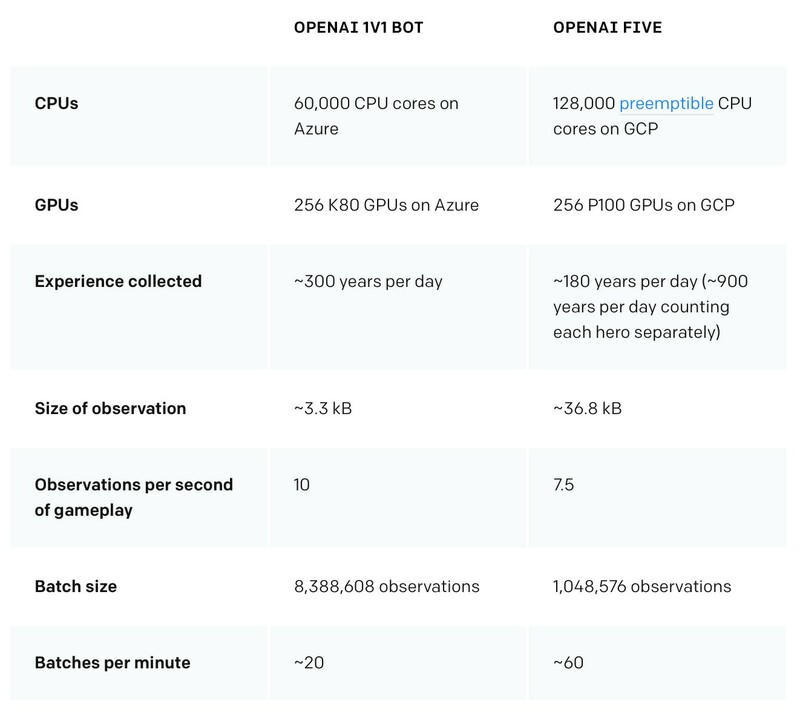 The experiment ran on 4,500 cores and 16 k80 GPUs, training to the level of semi-pros (70 TrueSkill ) rather than 90 TrueSkill of OpenAI best 1v1 bot). Binary rewards (win/loss score at the end of the rollout) scored a “good” 70. With sparse reward scored a better 90 and learned much faster. Creep blocking can be learned from scratch. For 1v1, OpenAI learned creep blocking using traditional RL with a “creep block” reward. bugs: large negative reward for reaching level 25. It turns out it’s possible to beat good humans while still hiding serious bugs! The International 2018 - Dota 2 Wiki where OpenAI might battle the all-star or winning team like last year’s 1v1 bot test. Can 'Interview vs Audition' Approach Works for Software Engineers?